Chic glamour from American fashion label Michael Kors. An elegant white dial features a pavé inner dial ring and rose gold-tone Roman numeral indexes, beautifully complemented by its sparkling stone set bezel. A stylish rose gold tone, sleek three-link-bracelet with glitz detailing down the centre and sparkling crystal toping bracelet offers a contemporary edge. 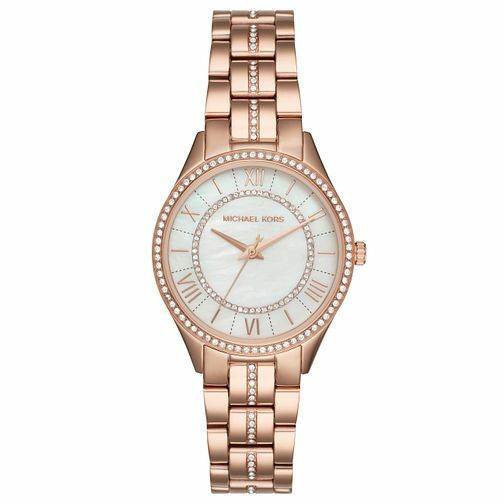 Michael Kors Lauryn Ladies' Rose Gold Tone Bracelet Watch is rated 5.0 out of 5 by 1. Rated 5 out of 5 by Anonymous from Lovely looking watch I was very pleased with my purchase (a watch for my granddaughters birthday. It was easy to order and when I was notified that it was ready to collect at the store. May I say that the after service was 1st class. The strap was a little large for her wrist but the shop assistant took it away and fitted it for her in a couple of minutes. We had one happy granddaughter and one relieved gramps.